Our motto is to spread "Japanese culture to the world". 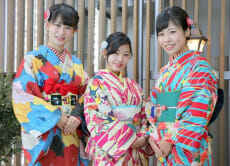 So we want many people from many countries to come and experience the beauty of Japan's traditional outfit, kimono. Not only that, we also provide kanzashi (Japanese hair accessories) and hairdo for women. 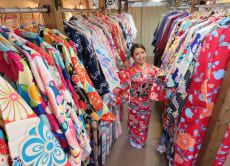 Here in Kimono Rental Wargo you can choose many kind of high quality kimono, from sightseeing to the ceremonial ones. Plan is all in full set, so you can come empty handed to our store. Our team will give our best hospitality to welcome you. We have 8 stores located in Kyoto area, Osaka Shinsaibashi, Asakusa Tokyo, Kamakura and Kanazawa. All the stores are close to famous spots and convenient to visit by train/bus. Walking down the city, ride human rickshaw or have a photography session, please enjoy this popular activity to your fullest! Feel free to make inquiry and get in touch with us. We will be waiting for your visit !